This is a simple shawl pattern, similar to the popular Granny Square Triangle Shawl. Made with the Box Stitch Pattern it does not display all of the holes of a true Granny Square Stitch. It is worked with worsted weight yarn and it is what I would consider a very generous size shawl for those of us who dislike bare arms and want lots of coverage. Row 1: chain 6, sl st in first st to form ring. Or start with Adjustable Loop Row 2: chain 3, 3 dc, ch 2, 4 dc in ring, ch 1, turn ( 8 dc) Row 3: sc in space between first 2 dc, chain 3, sc in ch 2 space, ch 3, sc in same space, (point made) ch 3, sc between last 2 dc, turn. Row 4: ch 3, 3 dc in first single crochet, (this adds a new cluster to the beginning of each dc row) 3 dc in ch 3 space across row to the 3 chain loop (point) work 3 dc, ch 2, 3 dc in loop, 3 dc in next 3 ch sp, across row ending with 4 dc in last single crochet, turn. 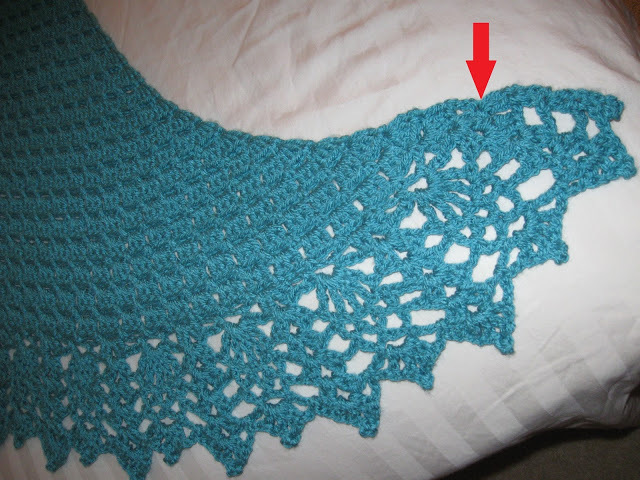 Your shawl will gradually form a natural curve at the ends as double crochet rows are added. Row 5: ch 1, sc between first 2 dc, chain 3, skipping 3 dc, work a sc between the dc stitches forming groups of 3 dc clusters, to the point. In the point work sc, ch 3, sc all in the same space, ch 3, continuing to form 3 dc clusters to end of row, ending with ch 3, sc between last 2 dc, turn. Repeat: rows 4 and 5 until you have 28 double crochet rows. Depending on your choice of border you may wish to work row 5 one more time to take advantage of the 3 ch loops as a base for the border. I love a basic fringe for a border; of course, as always, you may add the border of your choice or none at all. On this shawl I wanted to make it a bit more fancy so I adapted the border from Doris Chan’s “All Shawl” which can be found in her free pattern on Ravelry. 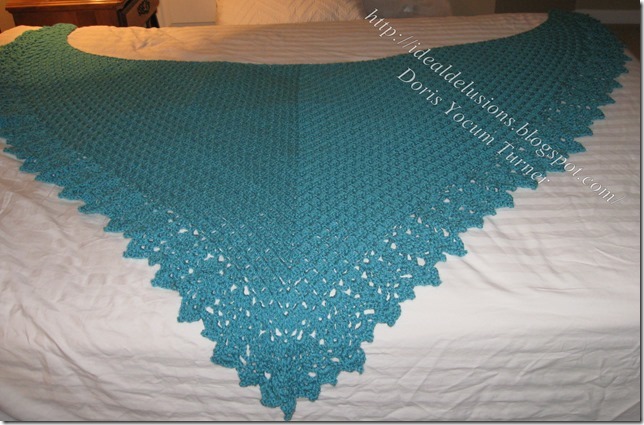 If you wish to add the same border I did, you need the All Shawl pattern by Doris Chan. If you observe the pattern you will notice it alternates shell patterns with pineapples. I ended my shawl on a single crochet row so I would have the chain 3 loops to work in, instead of the double crochet stitches. I wanted a pineapple stitch to be at the center of the point, so starting at the point, instead of counting as 1, 2, 3, I counted the point loop as a pineapple, space, shell, space, pineapple, space, shell, space pineapple, etc.. until I got to the beginning of the row. I followed that graph and I chained 3, ((but I worked a double crochet in the same stitch (see red arrow) on my photo below because I wanted a solid edge) then I worked chain 1, double crochet shell, ch 1, skipped a loop, triple crochet set, (to start pineapple) skipped a loop, worked a dc shell, skipped a loop...repeat to the point. In the point I worked the triple crochet set for the pineapple, then starting up the other side I skipped the next ch 3 loop and worked a shell, skip a loop, start triple crochets for the pineapple. When I got to the end of the row I chained 1 and worked 2 double crochet in the last stitch. There you have the base for the border. NOTE: If the the base for the border seems a bit tight for your shawl, try putting 2 chain stitches between each shell and pineapple stitch instead of just 1 as you work across each row. Follow the graph rows 3 – 6 working shell in shell stitches and pineapple stitches required for each pineapple to complete your border. Page 8 gives a close up detail of how the finished pattern should look. I received an email that said, in part: “I finally got it worked out but not starting with a shell but a space. I am glad I counted the pattern back to the start and not assumed mine was the same as yours. I took advantage and made my edging border begin with ch 3,dc,dc, in the first 3 stitches. Then did a shell in the next loop. It worked out great and the pineapple hit the point loop. I finished the row with 3 dc in the last 3 stitches. That really gave me a nice straight edge for the border all the way through. I found the graph a bit confusing as well. How you applied it to your pattern made perfect sense to me. This shawl is displayed spread out on a standard double size bed. This is the same shawl and the third and last view for this post. I selected what I thought was a 16 ounce “mill end” bag of powder blue sports weight yarn, that I purchased at A. C. Moore for this version of the shawl. I used a simple “V” stitch border with a picot in the last round to soften the edge and it was worked with a size “J” Susan Bates hook. I like to use a large hook with a light yarn for a softer, flexible feel to the finished item. I do have to crochet slower as it is more difficult to maintain an even tension with an oversized hook.. I am delighted how it came out and also surprised. I expected it to be smaller than the others because of a lighter weight yarn but it is in fact larger. Why ? I didn’t know so I weighed the shawl. It would appear I acquired a very generous mill end bag that was actually 18 ounces and not the expected 16. The shawl is about 47 inches from the shoulder to the point and it is about 94 inches wide. I do not have a place where I can spread it out flat and take a photo of it but I did get a few photos and close-ups. This shawl can also be made in any size from a shoulderette to as large as you like. I, myself, love an oversized shawl as I like generous arm coverage. When the shawl is as large as you want it you can add the border of your choice. To make the border on this shawl, I stopped the basic shawl pattern on a single crochet and chain stitch row, reference (row 5), turn..
Row 2: Ch 3, dc in first dc, “V” stitch in center of each “V” stitch, to point. Work “V” st, chain 3, “V” st in the center space of the point, “V” st in each “V” st to end. 2 dc in last stitch. Picot stitch: Double crochet in center of “V” st, chain 3, slip st in first chain of chain 3, dc in same “V” stitch = "V" st with picot on top.. Final round Work "V" st with picot, in the center of each “V” st of the previous row, working (dc, picot, dc, picot, dc, picot, dc) in the center chain space of the point, work “V” st with picot in the center of each “V” st to end, 2 dc in last stitch. To help you plan ahead, this shawl had 35 double crochet rows, 35 sc / chain stitch rows and 5 rows “V” stitches for the border. When I finished this shawl I had only about 7 inches of yarn left, it was that close. Yes, I know I said the blue shawl would be the last one I posted for this pattern but today I want to talk about “Caron Simply Soft Party Yarn”. Since I did add a little something extra to the design I thought I would just sneak it in on this same post. The color of this shawl is Silver Sparkle but there is a nice selection of other colors and I loved working with this soft, shiny yarn. I think it made an elegant shawl. Modest but has a discreet sparkle that can be worn day or evening. This shawl is a bit smaller and is more for dress up than a heavy duty working shawl. I worked the pattern until I had completed the first 5 rows of double crochet groups. On the next row instead of single crochet, I worked a double crochet and chain stitch row. So the row would be worked as ch 3, dc between first 2 dc, chain 3, skipping 3 dc, work a dc between the dc stitches forming groups of 3 dc clusters, to the point. In the point work dc, ch 3, dc all in the same space, ch 3, continuing to form 3 dc clusters to end of row, ending with ch 3, dc between last 2 dc, turn. The following row, I resumed the pattern of double crochet groups stitches and worked as per the pattern. On this shawl I put my space row after each set of 5 double crochet rows. To do this I inserted the row of double crochet and chain 3 stitches instead of single crochet and chain 3, then resume the pattern. The height of the double crochet stitches are what make the spaces. You can put the spaces rows anywhere you want them. The border on the Gray Sparkle Shawl is also an adaption of the border created by Doris Chan for her All Shawl Pattern. It is the same as the border on the first shawl shown on this post. The information and link and my adaption notes are listed above with the pattern instructions.